I love painting fabric. I have done my fair share of it as well. My painted stenciled headboard was even featured in Better Homes & Gardens magazine last year. I also have a great post I put together on my top tips for painting fabric. 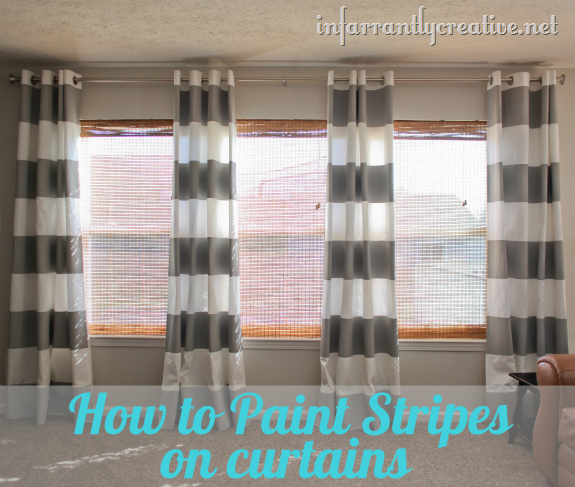 When Erin and I were trying to figure out how to add color into her son’s room painting striped curtains went to top of the list – especially when we couldn’t find fabric in the exact colors she was looking for. Since I had painted curtains previously I knew this would be a simple project – especially with both of us working on it together. It was a great way to tie all the colors we wanted in the room. 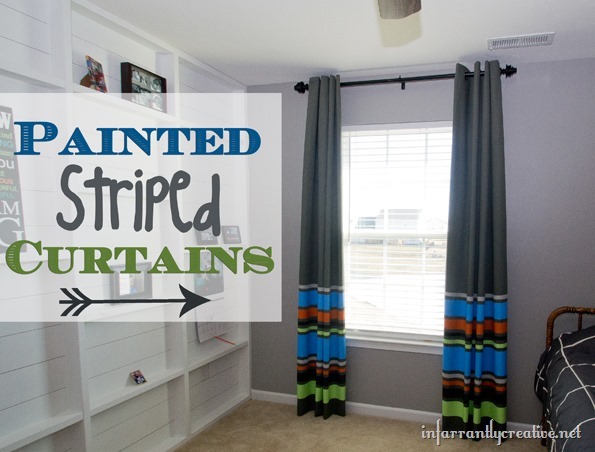 Painting plain curtain panels allows you to get the exact design and color you want. I always seem to have a hard time finding curtains that I like. I searched around looking for striped curtains. I was inspired by the Crate & Barrel Alston Panels for $99 a piece. So they were either way out of my price range or not long enough. I decided to customize some plain curtain panels from IKEA by painting gray stripes on them. They look amazing and totally changed the look of my family room.